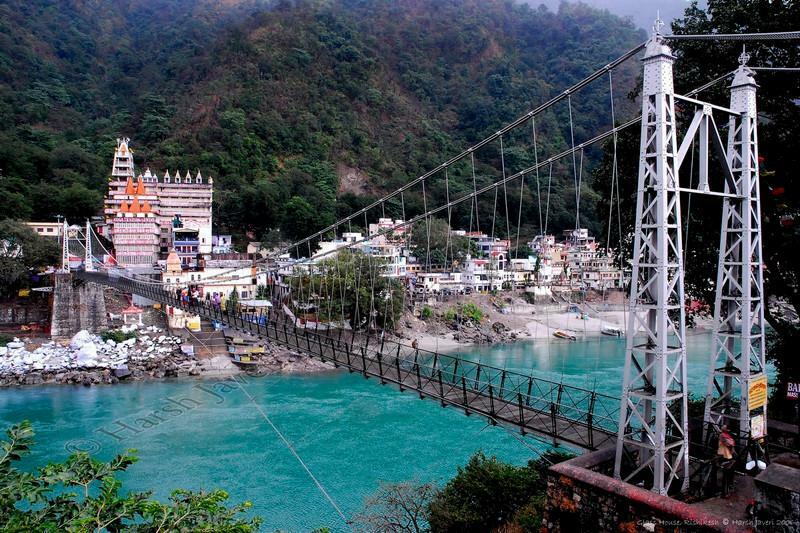 Himalayas, Ganges, Pilgrimage, Spa, Rafting, Ayurvedic Treatment, Yoga, Meditation, Nature, Camping.... if there is one word for all these, it's "Rishikesh"! Rishikesh - known as the "City of the Divine"- is a spiritual center to which sages, rishis, saints and pilgrims have flocked for millennia. The roads of the city are lined with bustling market places of ethnic arts and handicrafts, fresh produce markets, holy shrines and orange -robed sadhus (priests). Then, the road narrows, the markets become more sparse and you come upon a foot bridge, suspended high over the sacred Ganga (Ganges) river. As you cross this bridge, the sun streaming through the Himalayas to warm your being, you will feel as if you have truly come home. It is no surprise that pilgrims are drawn here from all over the world. The awe-inspiring beauty of the place, the clear, flowing Ganga, the majestic mountains, and the lush green forests will embrace and rejuvenate your entire being. What an interesting photo - i've never seen a place like this. Nice perspective. Wonderful photo! Beautiful place and terrific image. Looks like the bridge to paradise, very interesting! What a lovely bridge and the water looks so clean! I'm with Hippy!! I need to go there! OMG! It's gorgeous! Is that river really that clear and aqua colored?! Never heard of this before. but will be doing some research! Thanks, Harsh!! As I've said, I love my vicarious trips through you! Thanks for all your help on my photo dilemma! Wonderful perspective and such an interesting shot!